Cubic Space was established and is operated 24 hours a day by a group of in-house creative designers, set and special props craftsmen, events managers and production crews, all under one roof. 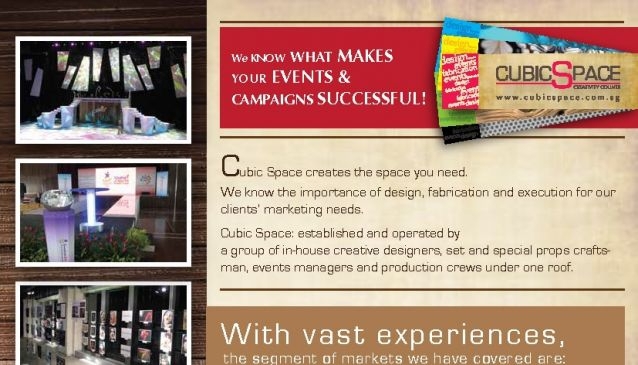 No matter the event or prop you are looking at, Cubic Space can suit all your corporate preferences. At Cubic Space, they believe in the importance of design, fabrication and execution for their clients' marketing needs and not just about giving out a product with your company's logo but even more importantly, one that embodies your organisation's branding. The satisfaction of their clients has always been their highest priority, thus, they stress on ensuring the highest standards of service and quality emphasising strict adherence to delivery, from the design stage leading to the end product. Some of their major clients include Media Corp, Resort World Sentosa, Ministry of Social and Development, Starhub, Sonic Gear, Nexans, Singapore Management University, National Library Board, Community Centres & many more.